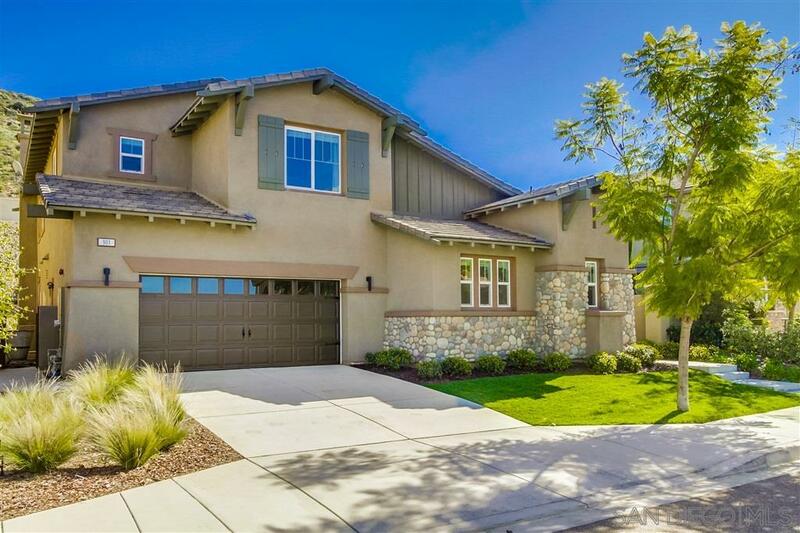 Picturesque Craftsman w/ desirable, private entrance casita â perfect for home office/guest suite. Near downtown SEH & new K-8 school. Large bedrooms, lots of storage. Ocean peek from office/den & bedroom. Quiet cul-de-sac street. Premium tile/new carpet & freshly painted throughout. Gourmet kitchen w/ SS appliances, double oven, espresso cabinets, granite countertops. MB w/ his/her WICs, private balcony. 3 car garage w/epoxy floor, Gladiator storage. Large patio w/ gas fire pit. Low Mello-Roos & HOA., â¢ Low HOA $80/month â¢ Low Mello-Roos $58/month â¢ Move in ready, freshly painted with Swiss Coffee color â new carpet â exterior trim painted â¢ Ocean peek from upstairs office/loft and bedroom â¢ Convenient to shopping in downtown San Elijo Hills â¢ Desirable casita with separate entrance- perfect for home office/in-law suite/at home college student â¢ New K-8 Double Peak School- @ 1 mile away â¢ Stunning evening sunsets â¢ Quiet Double Peak Rdâ road closes at sundown â¢ Low maintenance plant scape â¢ San Marcos fire station - .8 miles away â¢ Private yard â no rear neighbors â¢ San Elijo Hills hiking trails and Double Peak Park in walking distance - .4 miles â¢ Vaulted ceilings in Dining room and Living room â¢ Master Bedroom balcony with scenic hillside view. â¢ Ocean-view community all around â 1,200 ft elevation. â¢ Solar landscape lighting for dramatic nighttime entertaining â¢ 3 car tandem garage with epoxy coat floors and Gladiator Garage System. â¢ Amazing interior storage- large closets, cabinets, pantry!